This slow cooker turkey breast recipe is the BEST way to ensure you have a flavorful, juicy turkey with minimal effort and major delicious taste. I’ve attempted to cook a turkey 3 times in the past 5 years since I’ve been married. The first time, I tried a roasted turkey breast that was stuffed and tied. It was dry, had a chalky texture, and was bland overall. Turkey fail! The second time, Ryan attempted a very complicated smoked whole turkey recipe that involved a dry rub, injections, lots of basting, and careful temperature control on the slow cooker with little predictability about when the turkey would be done. The turkey was amazing; but way too involved to warrant replicating year after year, much less posting it on the blog and asking someone else to attempt it! But in this case, the third time’s a charm. Yes! I’m pleased as punch to say that on this most recent attempt to cook a turkey has resulted in an EASY, beginner-friendly, headache-free method that I’m more than comfortable with posting on Sweet Cayenne and asking you to replicate. Because I know you can do it! So let’s talk turkey! First off, you need to select a turkey breast! The size of your slow cooker will determine the size of turkey breast you can buy. My 6-quart slow cooker can hold a 6-8 pound, bone-in, whole turkey breast which has two breasts connected by the backbone. This is the exact turkey breast that I purchased. I made sure that the lid fit on top of the cooker before I thawed the turkey. Regardless of the size turkey you buy, I highly recommend choosing one that is bone-in with the skin on. The bones will result in a more rich and velvety gravy, more flavor in your turkey breast, and the skin will be used as a finishing garnish. Trust me on this one! Prepping your turkey for cooking is crazy simple…but you must remember to thaw it! My 8-lb turkey took 3 whole days to thaw. So if you’d like to have a turkey on Thanksgiving Thursday, I would start thawing it on Sunday for cooking ahead on Wednesday. To start the cooking process, we are just throwing a few apples, shallots, fresh thyme and cider in the bottom of the slow cooker. No chopping here! And the turkey will get a massage of maple rub, Dijon, butter, olive oil, and smoked sea salt. Sounds nice! You can put the rub underneath and on top of the skin, or just over the surface of the whole turkey breast. It’s nice to have some rubber gloves on hand for this. Your turkey breast may include a gravy packet inside. Just throw that away – you won’t need it with this recipe! 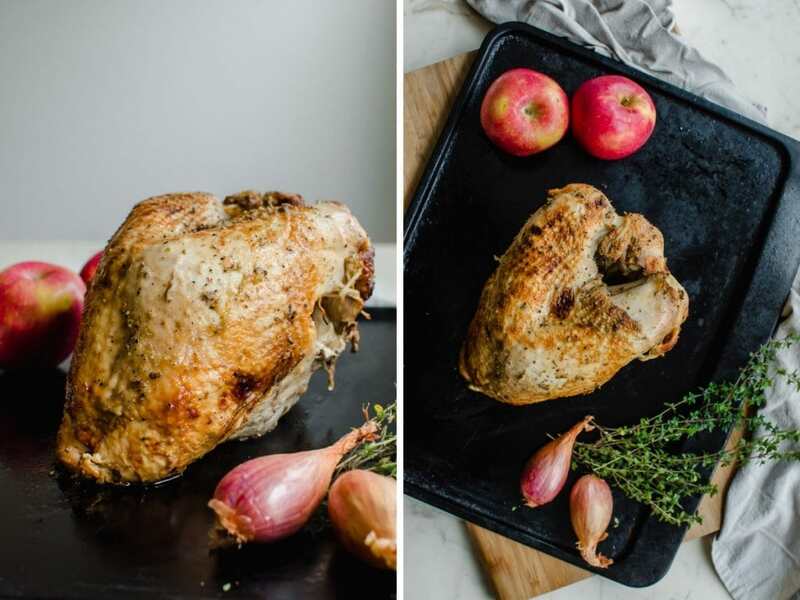 Once your turkey is all rubbed up, place it in the slow cooker with the apples and shallots situated around it and cook away! 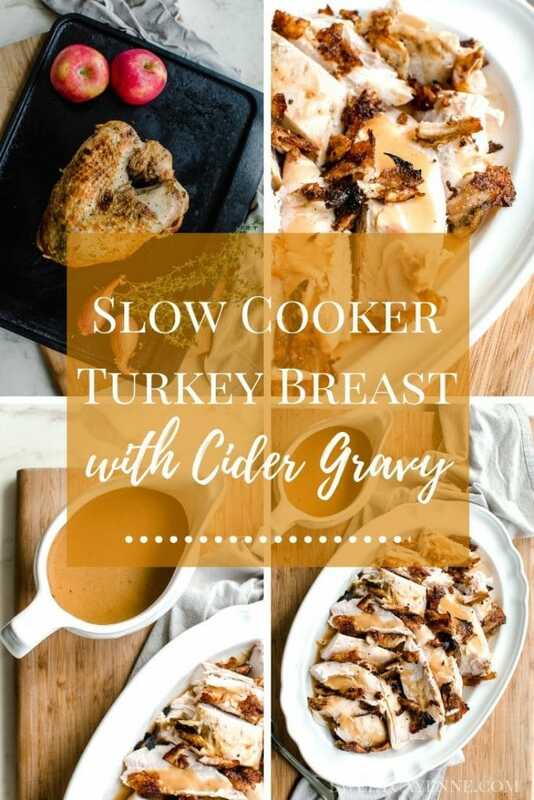 The slow cooker turkey breast recipe I’m sharing with you today is a dream come true because you cook the turkey breast the day before serving it! This was inspired by Ina Garten’s make-ahead roasted turkey that she shared this year. At first, I was skeptical about the idea of reheating meat for Thanksgiving. In my head, I envisioned meat with a rubbery texture. 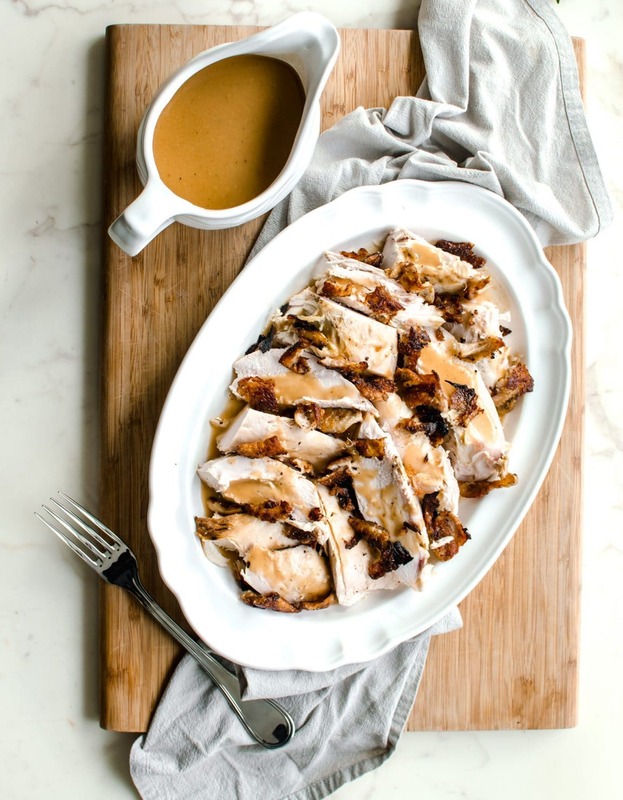 But Ina’s method involves gentle, low reheating of the sliced turkey with a base of gravy underneath, which keeps the meat juicy and tender as it reheats. After trying it myself, I was thrilled to discover that the meat’s texture was just like it was when it was freshly cut off the bone the day before. And the flavor was even better from the overnight resting time! So here’s the rundown: you will cook the turkey the day before, brown the skin under the broiler, then refrigerate the whole turkey breast – still on the bone – overnight. You’ll slice the turkey and skin the day you plan to serve. And there are two options in the recipe for reheating – one in the oven, and one for reheating in the slow cooker, in case you are short on oven space! After you’ve removed the cooked turkey from the slow cooker, you will simply strain all of the juices from what’s left at the bottom of the cooker, and refrigerate the juices overnight. This will allow all of the fat to solidify at the top, and you can scrape it off the next morning before making the gravy. 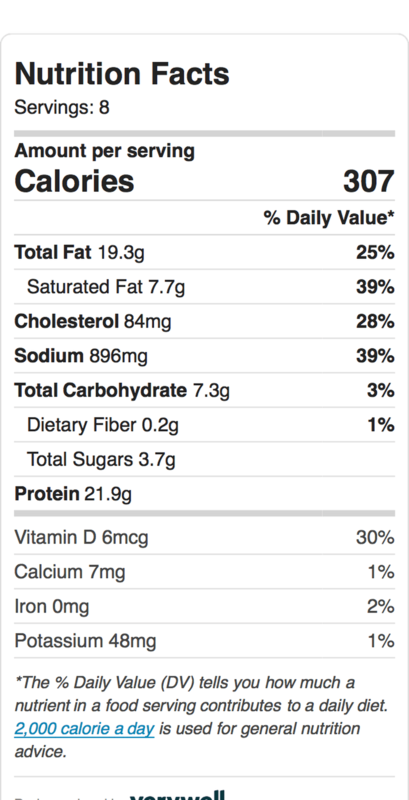 You will need a minimum of 2 cups of the strained juice for the gravy. You can top off with chicken stock or apple cider if you don’t quite have 2 cups. 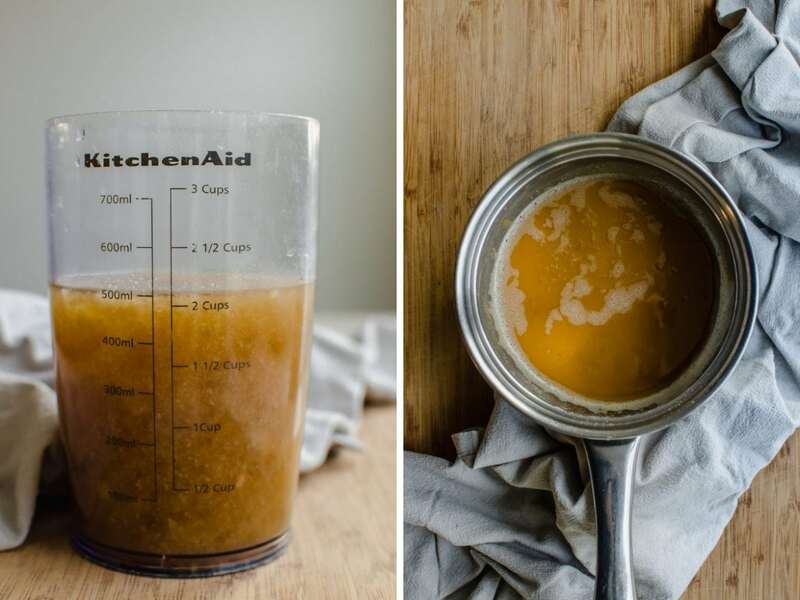 But if you have more than 2 cups of juices and want to make extra gravy, go right ahead! This gravy is thickened with a roux – a cooked combination of flour and butter. The flour and butter are cooked until it is the color of peanut butter (see picture on the right below) and smells nutty and fragrant. I’ve included instructions for thickening the gravy with cornstarch for those who need a gluten-free option in the recipe below. The day of the big meal, you will remove the skin off of the turkey breast, then slice the turkey breasts off of both sides of the backbone. Remove the skin from all sides of the turkey and cut the skin into 2” pieces. 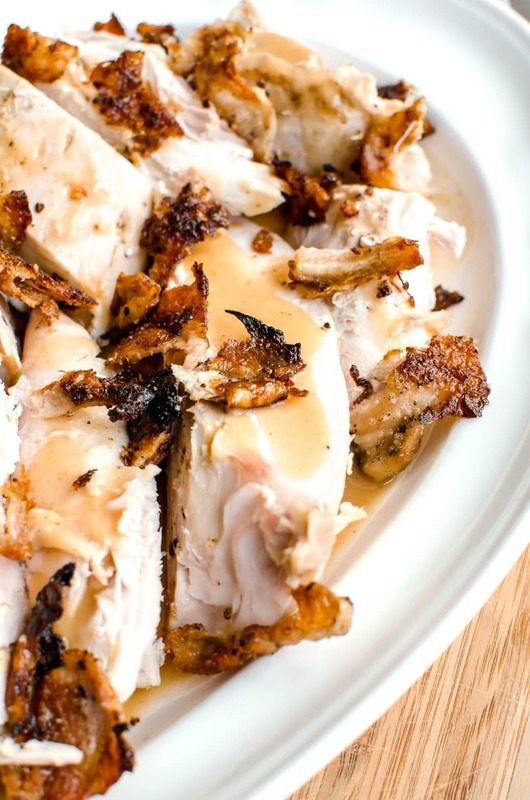 Slice each breast into 1”-thick pieces and remove any leftover turkey pieces from the bone. 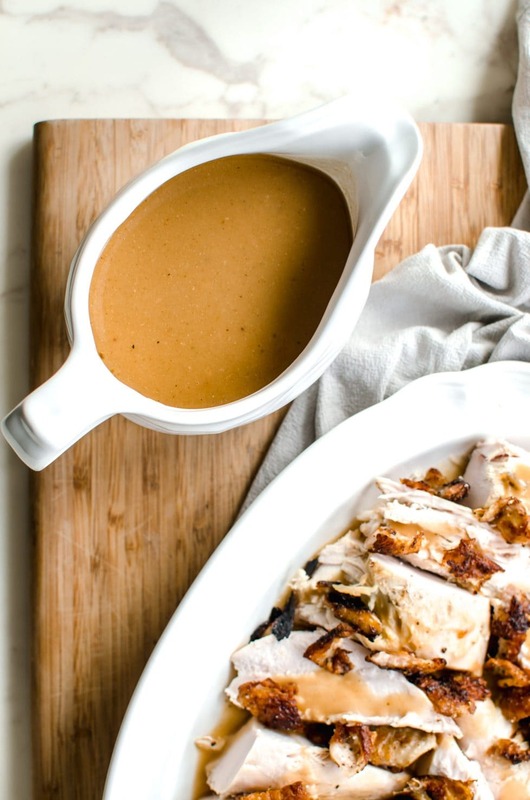 Once the gravy is prepped, you will simply spoon some into the bottom of an oven-safe serving platter (or the slow cooker) and place the sliced turkey on top. You can then cover and reheat in the oven or in the slow cooker. While the turkey reheats, you will crisp the skin in a skillet. 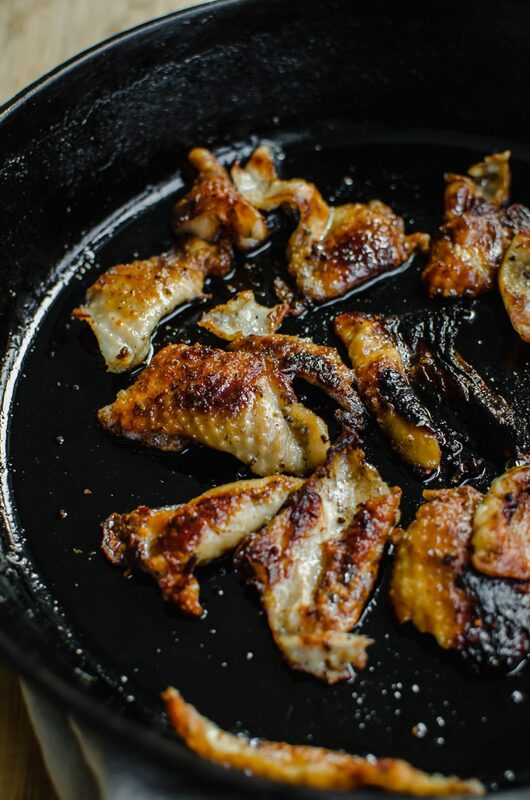 Now hear me out here – the crispy turkey skin is what turns this dish into something really special. This is what is going to have guests singing your praises. So, take my word for it and DON’T SKIP THIS PART! Even if you don’t want to eat crispy skin, someone else certainly will (ME! ), and in my opinion, you’re not really living if you don’t have a bite! Once the turkey is nice and hot, you crumble the crispy skin on top, and serve your delectable turkey with extra gravy on the side! And there you have it, my friends! I’m SO EXCITED to make this turkey again for my family Thanksgiving and hope you will give it a try! It’s perfect for beginner cooks, busy cooks, or someone that wants to eat well with minimal effort! 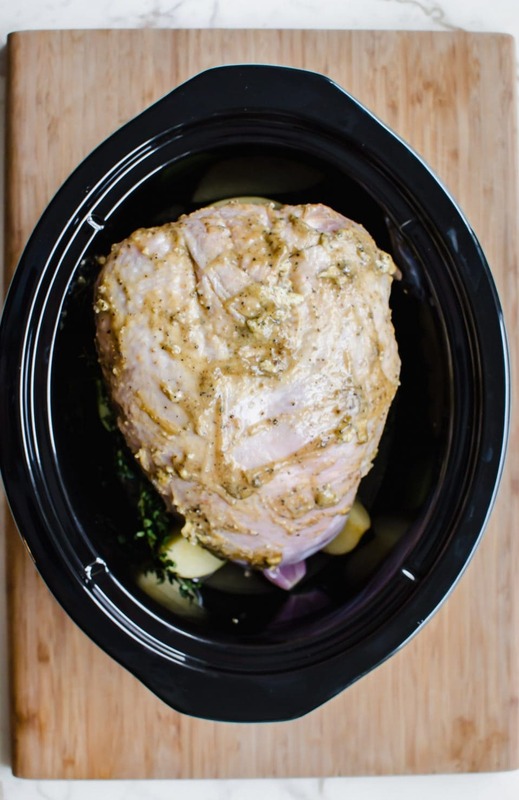 Are you ready to get make this Slow Cooker Turkey Breast? Good! I’m so excited for you to try this recipe. Once you get the chance to make it, please let me know how it turns out for you! Leave a comment and rate the recipe below. This will help me with the creation of future recipes! I’d also love to feature your creation in my monthly newsletter, so you can upload a photo to Instagram or Twitter with the tag @sweetcayenne5 to be featured! This slow cooker turkey breast recipe is an EASY way to cook a delicious holiday turkey with minimal effort! 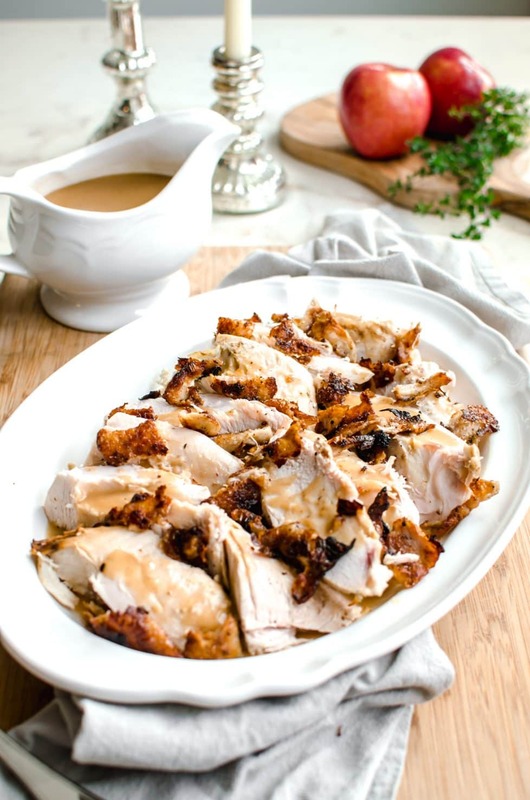 It can be made gluten-free and includes an easy cider gravy recipe! Place the turkey in a tray and set it in the refrigerator to thaw. Unpackage the turkey and pat dry with paper towels (discard gravy packet, if included). In a small bowl, combine the butter, olive oil, mustard, maple rub, and salt with a spoon (is does not need to be perfectly smooth). 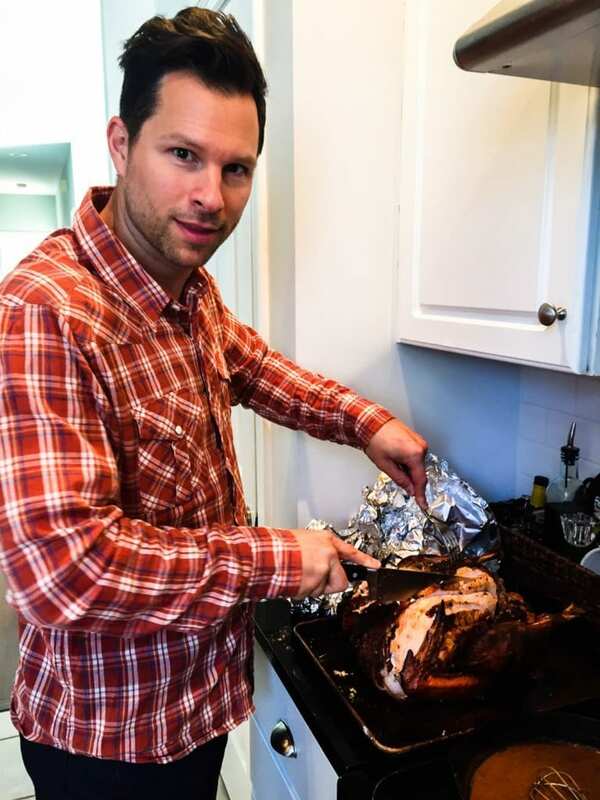 Use your hands to distribute the rub over the top and sides of the turkey, and under the skin if desired. Place the turkey in the slow cooker. Nestle the apples, shallots, and thyme around the base of the turkey. Pour the apple cider in the bottom of the cooker. Cook the turkey on LOW (not high!) for 6-8 hours until a thermometer inserted into the center of one side of a breast reads 165℉. Check the temperature at the 6 hour mark and in 30 minute increments until doneness is reached. Remove the turkey from the cooker and place it on a baking sheet. Let it rest for 10 minutes while you preheat the oven broiler to high. Make sure the top rack is placed in the lower half of the oven. 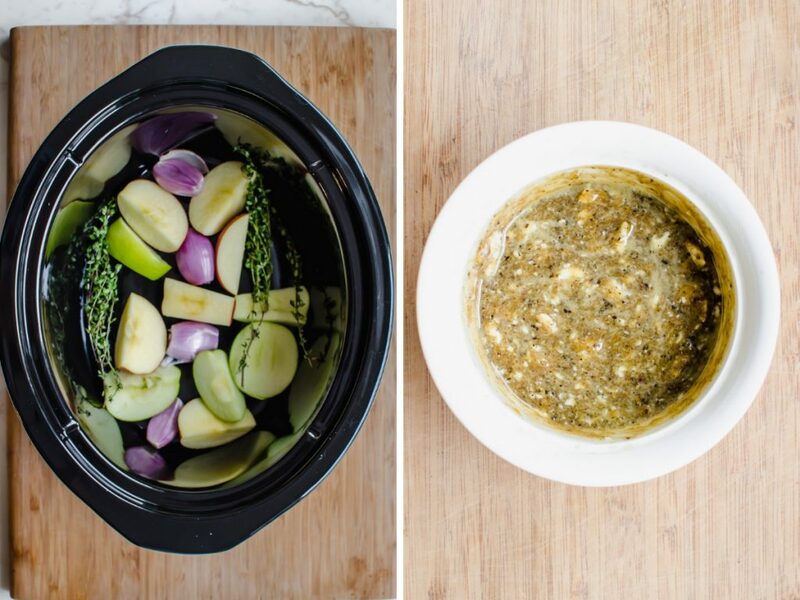 Strain the juices from the slow cooker into a container. Let cool for 30 minutes before placing in the refrigerator to chill overnight. Place the turkey breast under the broiler and crisp the skin in 2-minute increments on all sides. I rotated my turkey 4-5 times and used 2-minute increments to crisp the skin evenly all around. Remove the turkey from oven and let it cool for 15 minutes before covering with foil and placing in the refrigerator to chill overnight. Remove the turkey from the fridge and place on a cutting board. Preheat oven to 350. Remove the turkey drippings and measure out 2 cups. Freeze the remaining stock for later use, or double the gravy recipe. In a small saucepan, melt the 4 tablespoons of butter over medium heat. Whisk in the flour and cook the mixture over medium heat, stirring often, until it has a nutty fragrance and is the color of peanut butter (see photo). In a slow stream, add the chilled turkey juices while whisking constantly. Bring the mixture to a boil, then reduce heat to a low simmer. Cook, stirring occasionally, until the gravy coats the back of a spoon. Keep warm over very low heat until ready to serve. Season to taste with extra salt and pepper. While the gravy simmers, remove the skin from the turkey and cut it into 2’’ pieces. Set aside. Use your fingers to feel for the turkey backbone in the center of the two breast halves. With a boning or carving knife, carefully remove each breast from either side of the backbone. Use kitchen shears or your fingers to trim off any meat remaining on the bones. Slice the turkey breasts into 1’’ thick slices. When ready to warm the turkey, ladle about a cup of gravy into the bottom of an oven-safe serving platter (make sure the bottom is covered). Place the sliced turkey and any smaller pieces on top of the gravy. Cover the dish tightly with foil and place it in the oven for 30 minutes or until the turkey is heated through. While the turkey reheats, place the turkey skin in a cast iron skillet over medium-low heat. Cook, flipping halfway through, for 5-7 minutes until the skin is golden brown and crispy. Transfer to a paper-towel-lined dish and sprinkle with sea salt. Set aside until ready to serve. Remove from oven and place in a warming drawer or on a warm stovetop until ready to serve. Crumble the crispy skin pieces on top right before serving. Serve hot with gravy on the side. Alternatively, you can reheat the turkey in a slow cooker. Cover the bottom of the cooker with gravy up to 1’’ up the sides of the cooker. Place the turkey on top and reheat on LOW for 30 minutes. Set heat to “keep warm” until you are ready to place the meat on a platter and serve. Leftover turkey will keep for 3 days and freezes for up to 3 months. You can also freeze the turkey in the gravy! Make it gluten-free: bring the 2 cups of turkey drippings to a simmer over medium-low heat. Whisk 2 tablespoons of corn starch into 1/2 cup of cold apple cider. Pour this mixture in a slow stream into the simmering turkey juices while whisking constantly. Bring to a boil and cook, stirring constantly, for 1 minute. Reduce heat to low to keep warm until ready to serve. (If making extra gravy, you will need 1 tablespoon of cornstarch per cup of turkey juices. Mix 2 tablespoons of cornstarch per half cup of apple cider before adding to hot juices).